The Works Café in Keene, NH recently earned certification as a 3 Star Certified Green Restaurant® by the Green Restaurant Association (GRA), a national nonprofit organization helping restaurants become more environmentally sustainable. The Works Café received 208.51 GreenPoints™ on the GRA’s rigorous certification scale and implemented 53 environmental steps. The Green Restaurant Association’s (GRA) certification standards reflect 28 years of research in the field of restaurants and the environment. Thousands of restaurants and hundreds of thousands of restaurant personnel have provided the living laboratory for the continued evolution of the GRA Standards. The purpose of the GRA standards is to provide a transparent way to measure each restaurant’s environmental accomplishments while providing a pathway for the next steps each restaurant can take towards increased environmental sustainability. Composting Food Waste and Recycling Plastics, Glass, Aluminum, Cardboard, and Paper keeps up to 90% of waste out of landfills. By providing our customers with Reusable Dishes, Glasses/Mugs, and Utensils for dining in, they keep waste out of landfills and conserve natural resources. 76.2% of lights are LEDs, which use up to 90% less energy, last longer, contain no mercury, and emit fewer greenhouse gases than incandescent bulbs. Over 34% of their main dishes are Vegetarian, which significantly reduces the carbon footprint associated with food. 93.1% of their egg purchases and 54.6% of their dairy purchases are Certified Organic. Facility is Styrofoam Free, which keeps harmful chemicals and litter out of our environment. 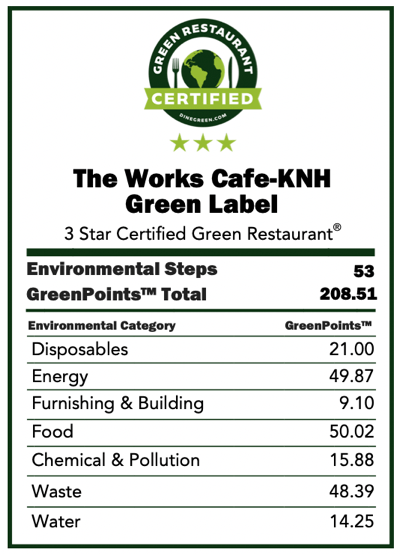 See The Works Cafe-KNH’s detailed Green Label and all their environmental steps. 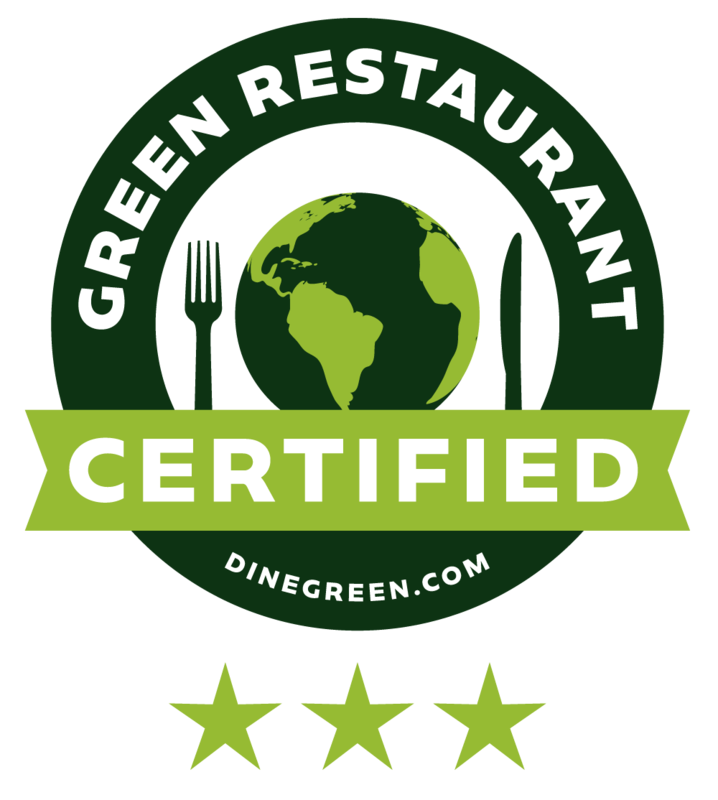 The Green Restaurant Association is a national non-profit organization that provides the only official Certified Green Restaurants® mark in the country. Since 1990, the GRA has pioneered the Green Restaurant® movement and has been the leading voice within the industry encouraging restaurants to listen to consumer demand and green their operations using transparent, science-based certification standards. With their turnkey certification system, the GRA has made it easy for thousands of restaurants to become more environmentally sustainable in a profitable manner. The GRA has been featured on CNN, NBC Nightly News, NPR, and in The New York Times, and The Washington Post. For more information visit www.dinegreen.com.